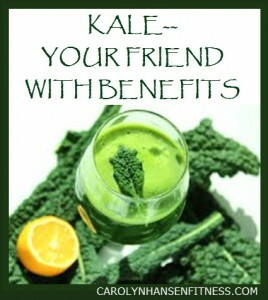 Kale is one of the newest super-foods and a very hot trend among the stars for its health benefits. All greens are nutritious but kale stands out from the crowd. Kale is not new…in fact, it used to be called the “poor peoples food” and now it’s a considered a power-food! Kale adds a nice earthy flavor, has fewer calories than most foods with more nutritional value. Curly kale has been around a long time and played important roles in European diets while dinosaur and ornamental kale are more recent additions. Kale is considered a cruciferous vegetable and descendant of wild cabbage. It is in the same family as broccoli or cabbage, is rich with nutrients and offers unsurpassed health benefits. In order to receive the fantastic health benefits of this power-food, you need to include it as part of your regular diet. Cruciferous veggies on a whole should be consumed no less than 2-3 times per week and it’s even better if you enjoy as often as 4-5 times a week in servings of at least 1 ½ to 2 cups. Just like its companion cruciferous vegetables, kale is being extensively researched in regards to its effects on cancer. Kale offers all these: antioxidant rich nutrients, much needed micro-nutrients, anti-inflammatory nutrients and anti-cancer nutrients in the form of glucosinolates. In fact, kale is the top food source for four glucosinolates and once kale is enjoyed and digested, these glucosinaolates are converted into cancer preventive warriors. Our oxygen metabolism becomes compromised when we do not have sufficient intake of antioxidants, our inflammatory system become compromised when are don’t have enough anti-inflammatory nutrients resulting in chronic inflammation. The combination of oxidative stress and chronic inflammation (both metabolic problems) creates risk factors in the development of cancer. Research studies on cruciferous vegetables…focusing on kale clearly show this super-food with definite with cancer preventive abilities. But kale’s benefits don’t stop with cancer prevention. Kale (raw or cooked) also provides valuable cardiovascular support with its ability to lower cholesterol. Additionally, this “green giant” of a vegetable plays a role supporting the body’s detoxification processes. It should be noted that kale also sports at least twice the amount of vitamins that other cruciferous vegetables, supports bone health and normal blood clotting and is high in fiber helping digestion and elimination. When you go to purchase kale, look for dark, deeply colored green leaves (they should be free of browning, yellowing or holes and bear in mind that the smaller the leaves the more tender they are) with moist hardy stems. Kale needs to be kept in the refrigerator as warmer temps tend to make it wilt as well as affecting the earthy flavor in a negative way. The best way to store kale is to refrigerate it in a plastic storage bag (remove as much air as possible before sealing). It should keep for about 5 days but be aware that the longer that kale sits the stronger and bitterer the flavor becomes. So, it’s best to consume kale as fresh as possible and don’t rinse before storing as water will cause spoilage. There are over 50 varieties of Kale and because the kale plants need frost to become sweeter and continue to produce late into winter it is the perfect super-food/green for fall or winter. Although kale is somewhat resistant to pests and drought, it’s best to purchase kale in organic form to avoid any nasty chemicals that may have been sprayed. Kale is great eaten raw…like raw spinach, is often enjoyed in green smoothies and is great when slightly steamed. You just can’t go wrong with this nutrient powerhouse. Eating kale is one of many proactive steps you can take in the war against cancer. Prevention is always better than hoping for a cure. Knowledge is power. If you’d like to find out RIGHT NOW if there is an invisible threat of cancer hanging over your head take my free Risk Test for Cancer.